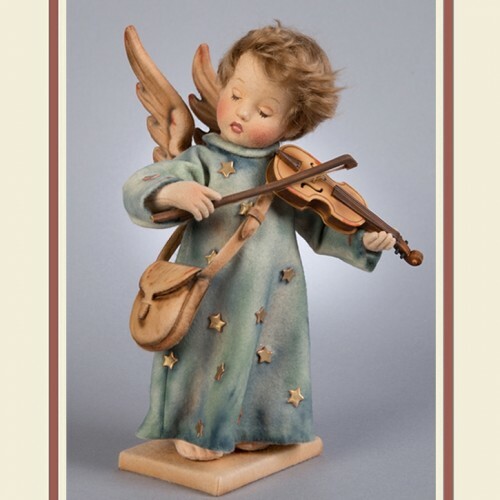 The third issue in the RJW Hummel® collection is the beautiful “Celestial Musician” based on an original illustration by Sister Marie Innocentia. The Celestial Musician is made of the finest all-wool felt. Fully jointed with the RJW ball & socket system with internal wood mechanism, this is the first RJW Hummel to feature the distinctive lowered eye lids. The moulded felt head has delicately hand painted features, and a wig of the finest mohair. The expressive hands have individually-sewn fingers and sculptural details. The Celestial Musician comes costumed in a classic all-felt gown with metallic star motif. The angel wings are beautifully sculpted and moulded out of felt and delicately hand painted. The entire costume has been artistically shaded in subtle hues to evoke the original Hummel coloring perfectly. The little musician holds a custom-made violin and bow handcrafted out of wood. A satchel made of all-wool felt hangs on a strap from one shoulder. Each doll includes a felt-covered wooden stand with a metal rod which inserts into a leg for easy display.